First published in 1989 to meet the needs of the growing fashion knitting community, Vogue Knitting: The Ultimate Knitting Book instantly became a trusted and beloved resource for knitters. 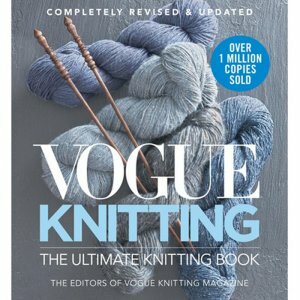 With updated, revised and new material throughout, more than 70 additional pages, and more than 1,600 photos and hand-drawn step-by-step illustrations, Vogue Knitting: The Ultimate Knitting Book, Completely Revised and Updated is surprisingly easy to navigate with thorough indexing and footnote cross-referencing. From beginners needing to learn the very basics to seasoned knitters needing a refresher on a complex technique, this is a guide that every knitter will cherish for years and years to come. Knit Simple - 2018 Holiday is a similar book: by vogue. You may also like Kate Atherley The Knitter's Dictionary: Knitting Know-How from A to Z, which is another similar book: special techniques category.